Gourdet’s extensive global travels to research and understand other cultures allow him to see Oregon’s lush bounty through an Asian lens, producing a constantly evolving seasonal menu inspired by cooking methods and ingredients he has encountered during continuous trips to Asia. He also recently returned to Haiti for the first time in 20 years to reconnect with his cultural heritage, a trip that inspired Haitian cuisine to become a special part of his culinary repertoire. A self-proclaimed health freak and avid runner, Gourdet views food as nourishment, finding creative ways to mitigate food waste and utilize ingredients fully from top to tail. His mindful life approach shines through in his cooking, as he offers diners dishes that allow freshness, seasonality, and bold, alternative ingredients to star on the plate. Gourdet grew up enjoying ethnic cuisine, especially traditional Haitian dishes emphasizing fish, rice and beans, roasted meats, pickled chilies, coconut, and plenty of herbs. It was while studying at the University of Montana and rooming with an avid cook that he discovered his culinary passion. He started as a dishwasher at a Missoula café, embarked on a semester abroad in France, and finally made his way back to New York after graduation to attend the prestigious Culinary Institute of America. He became the first student to land a highly coveted internship with Vongerichten, whom he trained under for close to seven years at three of his New York City properties. In 2008, Gourdet arrived in Portland, where he helped open Sage Restaurant Group’s Urban Farmer, and then served as Executive Chef for Saucebox, one of Portland’s oldest Asian-inspired cafés. In the spring of 2010, he took the reins at Departure, the modern Asian rooftop restaurant adjacent to The Nines, quickly gaining praise for his innovative dishes that combine local ingredients of the Pacific Northwest with meaningful preparations. In 2013, Gourdet was named Chef of the Year by the Oregon Department of Agriculture. He was dubbed Eater Portland’s Chef of the Year in 2014. In 2015, his fame skyrocketed as he earned runner-up in Bravo’s Top Chef Season 12, the same year he was first named a semifinalist by the James Beard Foundation in the category of Best Chef: Northwest. Gourdet has played an integral role in Portland’s culinary boom over the past decade. After much acclaim, he went on to open the second location of Departure in Denver in the summer of 2016. In 2017, he appeared on ABC’s 30 Years: A Celebration of the James Beard Foundation, as the crew filmed his journey from the Portland kitchen to New York City as he prepared for his first dinner at the iconic James Beard House. In 2018, he was named a semifinalist by the James Beard Foundation for Best Chef: Northwest for the second time. 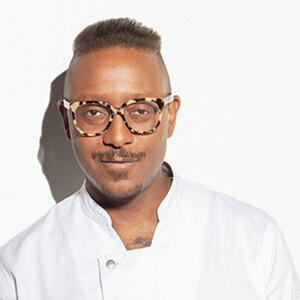 The same year, Gourdet appeared on Food Network’s Iron Chef Showdown, competing with Iron Chef Michael Symon in the final round. He currently resides in Portland but splits his time between the two nature-loving cities.